In the fall of 2016, a performance of Aaron Copland's Fanfare for the Common Man by the Pittsburgh Symphony Orchestra took on a special significance. With their regular concerts cancelled in the midst of a bitter contract dispute, Pittsburgh musicians put on a free public performance, joined by brass players from Boston, Cleveland, and Philadelphia, who had recently concluded their own strike. The Pittsburgh strike went on for nearly two months and, despite this show of solidarity, ended with concessions for the musicians. Their new contract agreement included a 10.5% wage decrease in the first year (offset by an anonymous donor to be a 7% decrease), with enough small increases throughout the rest of the contract that musicians would be paid, years later, what they made at the beginning of their strike. But perhaps the hardest blow was a change from a defined-benefit pension plan, which guarantees a set level of benefits after retirement, to a defined-contribution plan, which is more like a 401(k). Where orchestra veterans had been promised a substantial annual income in their later years, they were now responsible for making their own investments, and suffering any losses. 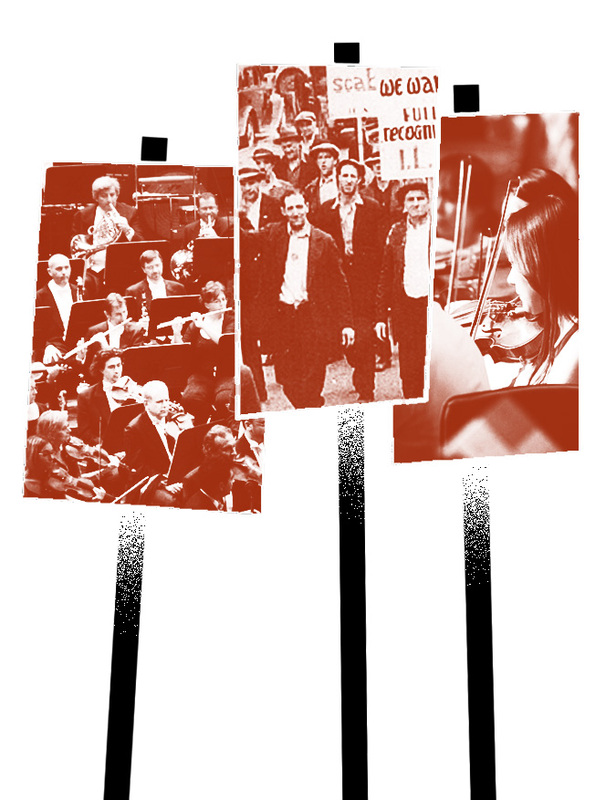 Since the Great Recession, orchestra musicians have gone on strike across the country, in cities like Philadelphia, San Francisco, and New York, as well as Pittsburgh, Fort Worth, Indianapolis, and more. The factors are two-fold. The recession caused revenues at symphony centers across the country to decline, through slumps in nightly attendance, season ticket holders, and donations. Orchestra managements, seeking to tighten budgets, asked musicians to take pay and benefit cuts or to forego raises. Sometimes these asks were enormous. In 2012, musicians in the Minneapolis Orchestra were locked out by management, after they refused to take pay cuts of up to 30 or 40%. The lockout lasted for 488 days, leading to the loss of an entire season of performances, their music director, and a host of players. But with the concessions they accepted, the remaining musicians won't reach their 2012 pay again until 2020. The second factor leading to labor strife is not slumping revenues, but slumping investments. The pension funds orchestra musicians have paid into across the nation took severe hits during the recession as well. In the years since, the funds are recovering, but so slowly that—while paying out retirees and taking in less money from diminished membership—they're still at risk. More than 50,000 musicians nationwide are participants or beneficiaries in the American Federation of Musicians' Employee Pensions Fund (AMF-EPF), a plan managed by trustees appointed by both the union and employers. Like many other multi-employer pensions, the plan was hit hard by the dot-com bubble's burst in the early 2000s and then again by the 2008 financial crisis, losing approximately 40 percent of its value. While investment returns have steadily improved since the recession, according to the trustees, there is still a growing gap between the plan's assets and liabilities. The trustees's 2018 "State of the Fund" report said that in the 2017 fiscal year, the fund paid out $158 million in benefits while receiving just $67 million in contributions. With such a divide between money paid out and money coming in, even if returns continue to be strong, trustees say, the fund is still in danger of becoming insolvent within 20 years. But orchestra musicians are not giving up their pay and pensions without a fight. 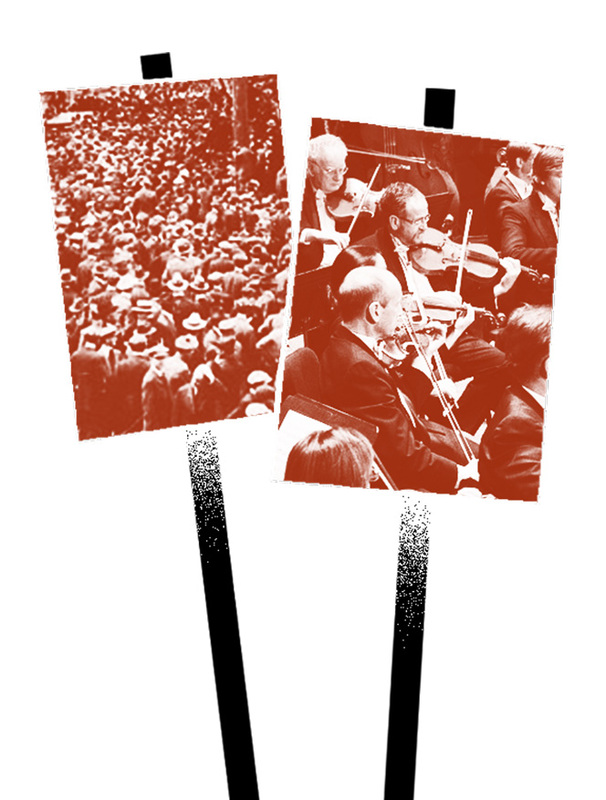 2010 - Detroit Symphony Orchestra went on strike, which lasted six months and ended in a 25% pay cut for new musicians. Sept. 2012 - Atlanta Symphony Orchestra was locked out. Musicians lost members, and eventually conceded to pay cuts and a shortened season. Sept. 2012 - Indianapolis Symphony Orchestra was locked out for a month, ending in pay cuts. Sept. 2012 - Chicago Symphony Orchestra went on strike for wages and healthcare, ending up with a slight raise and higher health insurance costs. Oct. 2012 - Minneapolis Symphony Orchestra was locked out in a wage dispute for more than 15 months. It won't be until 2020 that their wages are back at 2012 levels. 2013 - San Francisco Symphony musicians went on strike, securing a 4.5% pay raise, but paying more for healthcare. 2014 - Atlanta Symphony Orchestra was again locked out. Musicians ended up getting a small wage increase, higher healthcare costs, and more player vacancies. Sept. 2016 - Fort Worth Symphony Orchestra went on strike, ending after three months. They kept pay at current levels in the first year, with slight raises in following years, along with fewer vacation days. Oct. 2016 - Philadelphia Orchestra went on strike for two days. Musicians got small pay raises each year of the new contract and would add a few positions. Would also have to play more performances. Oct. 2016 - Pittsburgh Symphony Orchestra went on strike, ending with large concessions. 7% pay cut in first years, slight increases in following years. Lost defined-benefit pension plans. 2018 - Lyric Opera of Chicago musicians went on strike, accepted fewer paid weeks per year, fewer members, and got a 5.6% salary increase. 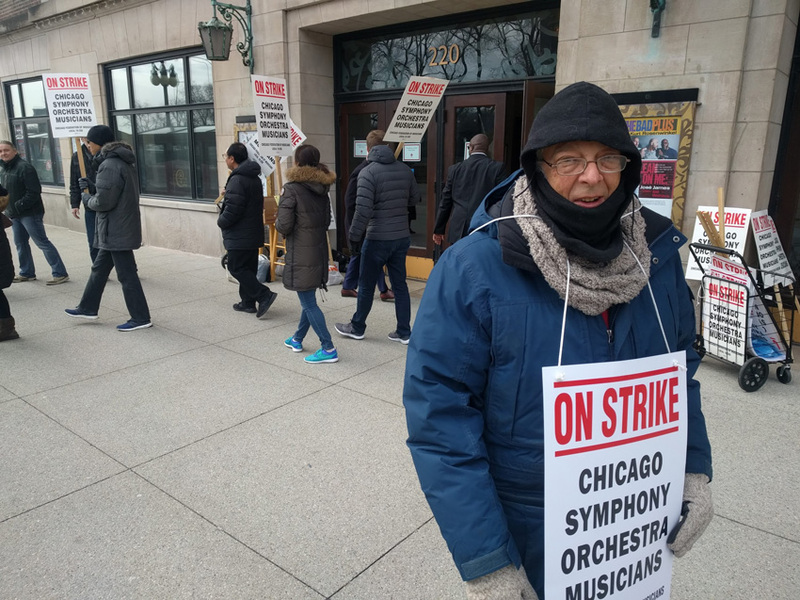 2019 - Chicago Symphony Orchestra went on strike to keep their defined-benefit pension plan and demand higher pay. The strike continues. This year, it was Pittsburgh musicians' turn to visit another city's picket line, after performers at the Chicago Symphony Orchestra (CSO) walked off the job March 10. In the first of a series of free concerts put on by the striking musicians, the CSO performed a program at the Chicago Teachers Union Hall. The orchestra—one of the most revered, competitive, and well-paid in the world, with annual salaries starting north of $150,000—played Beethoven's Egmont Overture. The piece, originally written for a play of the same name, is about a 16th-century Count fighting against Imperial Spain. At the beginning of the concert, Stephen Lester, CSO bassist and a member of the musicians' negotiating committee, thanked the standing-room-only crowd for their support. While he didn't go into the specifics of the negotiations there, he had previously told the Chicago Tribune exactly what was at stake. Like for players in other cities, their pensions are a key point of contention. CSO musicians pay into a private pension plan that faces many of the same issues as the national AMF-EPF. CSO management says that rising annual contributions to the musicians' pension plan, which amounted to $3.8 million last year—and could rise to $36 million in the coming years—jeopardize the orchestra's financial future. Lester told the Tribune, "There's no denying that a pension is an expensive benefit. However, we feel that if it had been properly funded in the first place, it wouldn't have been nearly as expensive as they're claiming it is. And also that the pension benefit is the best investment they can make in the future of the orchestra." The symphony orchestras most competitive to Chicago's—those in San Francisco, Boston, and New York City—still have defined-benefit pensions, even as other cities have switched to defined-contribution plans. The current pension "has been the hallmark of the orchestra's benefits package (and those of other leading orchestras) for over 50 years," CSO percussionist Cynthia Yeh said in a statement. By ending the defined benefits, CSO risks losing the premiere spot the orchestra holds in the minds of prospective players. Lester, again in the Tribune, also argued there's plenty of money elsewhere that could be used for contributions. "We have a $300 million endowment, we have a $60 million investment fund, completely at the disposal of the management," Lester said. The union contends that just a third of the orchestra's revenues and donations go to musician compensation, with bloated administrative and marketing costs and ongoing debt payments from an expensive remodeling of Chicago Symphony Center eating up the rest. "There's a certain sense that—when you've worked so hard for so many years and you are lucky enough and fortunate enough to win a job in the Chicago Symphony Orchestra—that that comes with a certain amount of security and stability," cellist Ken Olsen told Reverb. "Which it does, but I find it frustrating to feel that sometimes the interests of the musicians of the orchestra aren't always the highest priority." 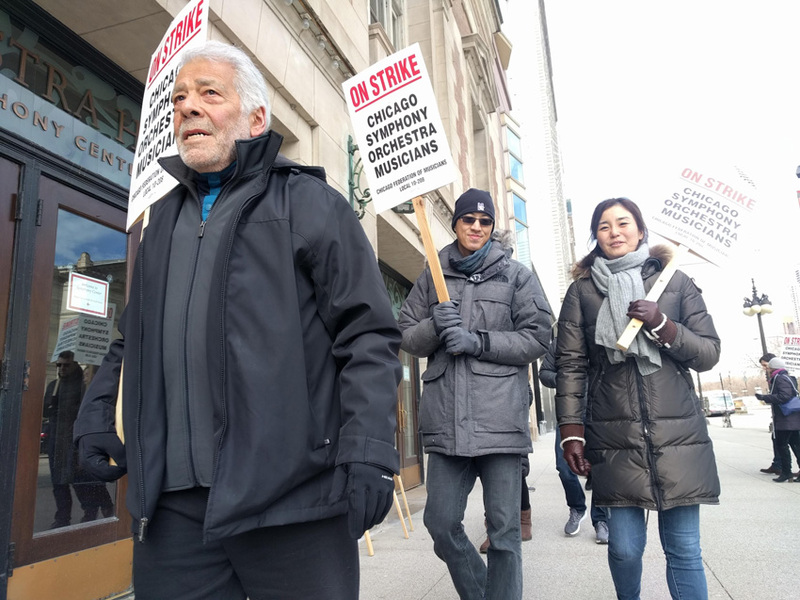 The current CSO strike is the second musicians' strike in the city in recent months, following a five-day walkout in October by musicians at the Lyric Opera of Chicago, who belong to the same union local as those in the CSO. The Lyric Opera strike ended with concessions for both union and management. The new contract reduced, from 24 to 22, the number of guaranteed weeks of work for orchestra members annually and cut the number of full-time orchestra members. Those musicians who kept their chairs would see a 5.6% raise over the three-year term of the contract. CSO itself went on strike in 2012, in the immediate wake of the Great Recession. Orchestra management, which had faced a $15 million deficit in 2008 and smaller deficits in all but one year through 2011, asked musicians to pay substantially more for their health insurance. While the pinch of the recession was felt, the mounting pension liabilities had yet to come to the fore. As negotiations proceed at the CSO, a national network of activist musicians is also fighting cuts threatened to the AFM-EPF, the fund that covers about 100 union locals nationwide. In December 2016, union members across the country received a letter from the pension trustees, informing them that fund could be insolvent and unable to pay benefits "as early as next year." The letter, which advised musicians to begin saving for their own retirement, "came out of nowhere for us," says Adam Krauthamer, a New York City French horn player who went on to co-found the national group Musicians for Pension Security. "It highlighted this huge disconnect between the people managing our pensions and the people depending on them." That disconnect included the union's national leadership, who, according to Krauthamer, presented the crisis as "inevitable" at a meeting with New York members seeking more information. "They basically said, 'this is just what happens with pension funds,'" he says. When Krauthamer and a group of other concerned union members began investigating, he says they found a slew of problems shared by other troubled pension funds, but that were by no means inevitable: bad investments, high management fees, and a cozy relationship between trustees for the union and those for employers. In fact, the union was a member of the lobbying organization that backed the 2014 passage of the Multiemployer Pension Reform Act. The law enables trustees of troubled pensions to seek and receive approval to cut benefits from the Department of Treasury. Since then, a handful of union pension funds have seen cuts, including a 29% reduction in benefits for Teamsters members. Musicians for Pension Security began a campaign of member education and advocacy, putting together the first national meeting on the issue and networking with lawmakers. In November 2017, the group was honored by the Pension Rights Center for its work promoting legislation that would establish a Pension Rehabilitation Administration and channel loans to restore collectively bargained pensions to solvency. The legislation, which would have wide impact on union pensions across industries, is still pending. Last year, Krauthamer also headed up an activist caucus that ousted his New York union local's long-standing leadership. Musicians for Change, the slate that won in an upset victory, pledged bolder action to address underfunded pensions and broader industry changes threatening musicians' livelihoods. "This is for the future of classical music, of orchestras, for the future of our musicians, for future musicians that haven't even joined an orchestra yet—that's what we're fighting for." Under the local's previous leadership, last year's contract negotiations at the Metropolitan Opera and the New York Philharmonic were settled quietly. Details of Metropolitan musicians' new contract were not released, while Philharmonic members agreed to assume more healthcare costs in exchange for a modest pay bump overall. 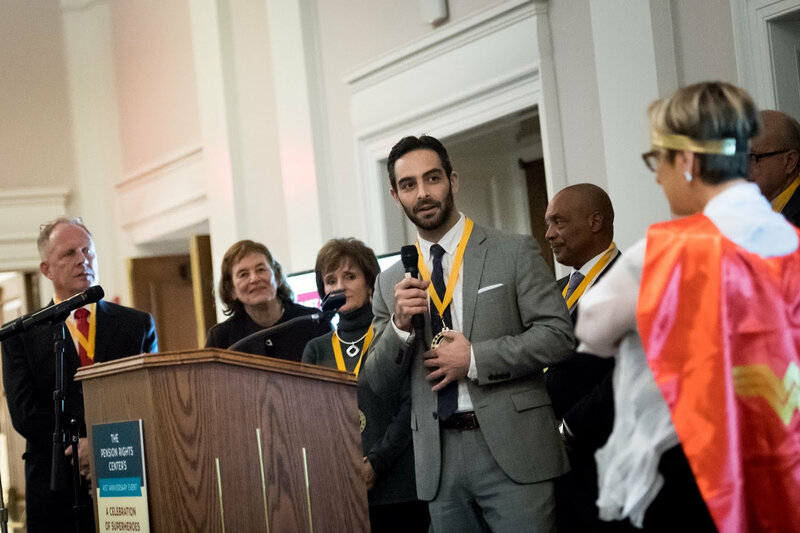 Musicians for Change will be negotiating its first contracts this year, and Krauthamer hopes that mobilizing more of the local's membership will help stem the trend toward concessionary contracts. "Rather than organize single jobs, we're really trying to organize the whole community of musicians in New York," he says. 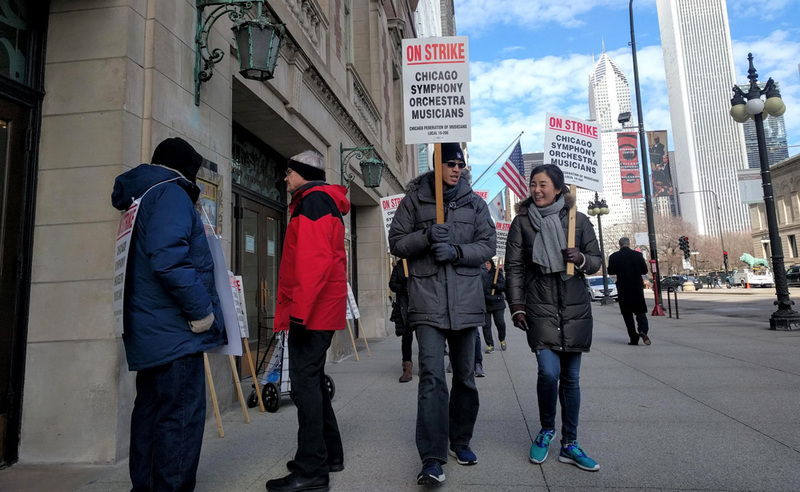 As Chicago orchestra musicians proceed with their longest strike since 1991, they're striking a similarly resolute note. "This is for the future of classical music, of orchestras," says Gina DiBello, who has played violin in the CSO for six years. "For the future of our musicians, for future musicians that haven't even joined an orchestra yet—that's what we're fighting for." Now well into its fourth week, negotiations between CSO musicians and management have broken down, with months of planned performances on the brink of cancellation. Even if the regular season goes dark, CSO will continue its free performances across the city. However, if the outcomes of other recent strikes offer any lessons, it's that even digging in for a long fight doesn't guarantee you'll win. Correction: An earlier version of this article misstated that the musicians of the Pasadena Symphony and POPS Orchestra went on strike in 2017. These musicians secured a pay raise (of 14.5% over five years) after voting to authorize a strike during contract negotiations.